We’re safe from many types of natural disasters here in Northern Colorado. Earthquakes, tornadoes, and hurricanes are either rare or non-existent in our part of the country. However, hail is something we’re very familiar with. In fact, Colorado is among the top 10 states that receive the most hail. From killing crops to damaging roof shingles to denting your car, hailstones are highly destructive. Learn how to protect your car from hail the next time a storm is in the forecast. The number-one best way to protect your vehicle from the elements – not to mention theft and vandalism – is to park in the garage. If you don’t have this ideal parking situation, any form of covered parking is better than leaving your car out in the open. You may normally park on the street or in an apartment parking lot, but if the weatherman predicts a hail storm, look for covered parking wherever you can, even if it means walking a distance to your house. If covered parking truly isn’t an option for you, blankets can help soften the blow of large hailstones. Car covers are available precisely for this purpose, but any large blanket will do. Just remember to tape the protective cover down, so the wind doesn’t blow it away. The tape may leave a sticky residue, but this should be easy to remove with a household cleaning product. It’s much easier to deal with a little tape residue than a pockmarked car after a hail storm. Plan ahead and strive to have your vehicle covered in advance of the predicted storm. Your neighbors might snicker if you tape a blanket on your car and the forecast doesn’t end up following through, but it’s better to be safe than sorry! 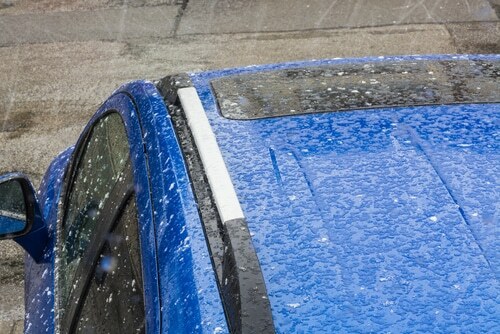 Opt for personal safety and skip putting a blanket on your car if the hailstones are already falling. What if you’re on the road when the hail storm strikes? It may be possible to continue driving through mild hail, but if conditions start to deteriorate, pull over and find a place to ride out the storm. Look for a parking garage or overhang to park your car under. Even seeking shelter beneath a tree is better than leaving your car out in the open. Just remember to stay in your car where you’re safer from potential lightning strikes than you would be standing under a tree. Unlike collision coverage, comprehensive insurance covers damage done to your car by an event other than a crash. Depending on your specific coverage, your insurance should help pay for damage caused by fire, flood, theft, vandalism, animal strikes, and storms, including hail dents. Check over your policy before the next storm arrives. For your peace of mind, consider boosting your comprehensive insurance coverage for ample hail protection this spring. You can also seek Rental coverage, which helps pay for a rental car if you need one while repairs are being done on your car. Scott’s Fort Collins Auto offers free loaner vehicles for qualifying repairs. We also have a strong relationship with multiple rental car agencies in town that can have a vehicle ready and waiting for you at our facility when you drop off your car. Just keep in mind that we are not responsible for your rental car expense. If worse comes to worse and your car is damaged in a springtime hail storm, count on Scott’s for the repair work you need. Our goal is to keep your vehicle in like-new condition for as long as possible at the lowest price. Plus, if you have the aforementioned comprehensive insurance coverage, bodywork is even more affordable. When you’re ready to pay us a visit, schedule an appointment online or call (970) 682-4202 to let us know when you’ll be stopping by.